As politicians outline rival visions of a green agenda, an airline has angered environmental campaigners for flying an empty passenger plane in order to keep hold of its landing slots. The British Mediterranean Airways (BMed) round-trip flights between London's Heathrow and Cardiff International have been taking off six days a week since October. They have not appeared on departure or arrival boards, none of the 124 tickets were sold and all passenger seats remained empty. And to the chagrin of green campaigners more than five tonnes of CO2 has been pumped into the atmosphere on each 140-mile journey. But why would an airline be prepared to run hundreds of flights at a loss? Industry experts said the incident was rare but illustrative of an airline protecting its highly sought-after landing slots at Heathrow, which have been known to fetch up to £10m each. BMed acknowledged the situation was "not ideal" and said it was temporary. It disputes reports that the empty flights have cost it £2m, but acknowledges a business motive lay behind the decision. The airline started the empty flights after scrapping its service to Tashkent in Uzbekistan, in the wake of civil unrest. The internationally recognised landing slot policy independently administered at Heathrow by the firm Airport Co-ordination Ltd (ACL) is known as the Use it or Lose it rule. An airline needs to make at least 80% use of its allocation over a six-month session to preserve the entitlement or it risks seeing rivals take over the slot. There are provisions for airlines not to use slots and still retain rights if this can be justified on the basis of "unforeseeable" circumstances. However, this would normally only cover a short period. BMed decided it was not practical to formally launch a passenger service just for a few months. The airline, which flies to 17 destinations throughout Africa, the Middle East and Central Asia, says it will start using the slot again for commercial flights in April 2007. "Since BMed intends to operate the slot on revenue services during the 2007 summer and winter seasons, it was necessary to preserve the slot," said BMed chief executive, David Richardson. "Flights to Cardiff represented the most cost-effective way to do this." 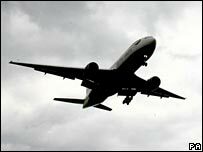 Environmental campaigners said the flights showed up "anomalies" in the current air tax system. "It is a crazy situation but the tax regime supports this kind of behaviour," said Richard Dyer from Friends of the Earth. "If you had a system in place, such as the one the Lib Dems and Conservatives propose where airlines pay a tax on every plane based on carbon emissions, there would be a much greater incentive not to run these kind of flights." Cardiff International airport, meanwhile, stressed it had no power to refuse BMed landing slots. "It would be inappropriate and unworkable for it to act as an arbiter in relation to the nature of one airline's operations in comparison to those of other airlines," it said in a statement. An ACL spokesperson said: "No other airlines are doing this. It is not a common occurrence but airlines are free to use their slots as they wish."